Looking to bring your company together? Look no further! SpeedPro East Bay has all the signage you need to organize an effective yet fun company event. From company parties to casual hangouts between coworkers, SpeedPro East Bay can provide you with the vinyl and trade show displays to reinforce corporate culture. Here are some ideas for company events that SpeedPro East Bay can help you with. Host a stand at a trade show! These events are a great way to publicize your company to other companies and customers in your industry, and almost always lead to greater brand recognition! 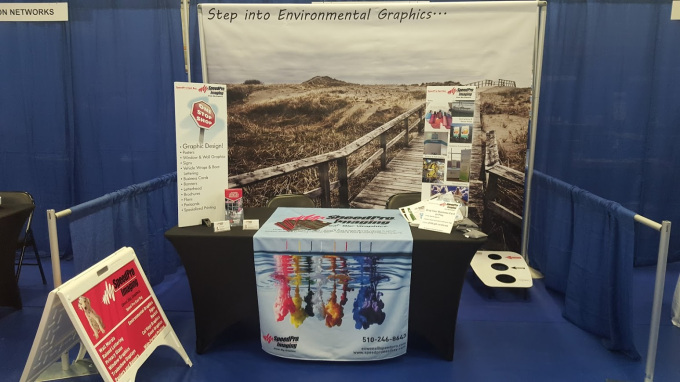 To attract customers to your stand, SpeedPro East Bay offers a wide variety of banner stands and tablecloths-with your own custom design, of course! Planning to take pictures of your employees at your event? Use a backdrop from SpeedPro East Bay! Put your brand at the forefront of the backdrop to make an impression on the event attendees. Also, you can track who came to your event with the photos with the backdrop! Use a banner as decor at your event! SpeedPro East Bay offers a wide variety of banners that can be customized to fit your every need. Simply come up with the design you want and contact us!